The ParaWulff design combines the two with the parachute hackle tied on each side of the calf’s tail “V.” The result is a decidedly handsome pattern that is as functional and sturdy as it is good looking. Photo by Umpqua Feather Merchants. IN THE SPRING of 1931, the fly fishing duo of Lee Wulff and Dan Bailey could be found fishing the prolific trout streams of up-state New York using Lee’s new and revolutionary hair wing dry flies. Adorned with buoyant and sturdy buck tail fibers on their wings and tails, Lee’s new creations were a far departure from the sparse dressings of the day. As these flies first hit the water, we began a whole new era in dry fly trout fishing … sturdy attractor flies with meaty silhouettes that rode high in the water and fished well in fast currents. Exactly forty years later, another fly fishing duo, Doug Swisher and Carl Richards, were busy setting the stage for the next era in the history of dry fly design with their launch of the parachute dry fly. Although the originator of the parachute dry fly is unknown, it was the Swisher/Richards bookSelective Trout (Crown Books, New York, 1971) that brought this effective way of tying a dry fly to the forefront of trout fishing. Like peanut butter and jelly, these two separate and distinct ideas have come together in one innovative pattern designed by guide, author and professional tier Jack Dennis and aptly named the ParaWulff. The standard parachute dry fly usually has a small tuft of white calf tail tied perpendicular to the hook shank with a hackle wing wrapped around it, forming in effect a feather parachute. 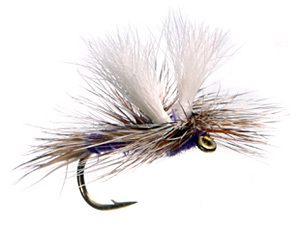 Parachute dry flies offer the angler many advantages over standard hackle-collar duns. Most importantly, they ride low in the water, indenting the surface film and thus offering the trout a full-length view of the head, thorax and abdomen. Considering that trout often view mayflies from the bottom up, this detail creates a more life-like appearance and makes parachute patterns especially well-suited for heavily fished trout. Conversely, the standard Wulff dry fly has two hair wings tied upright and separated in place of what would normally be hackle tips suspended in the hackle collar, creating the illusion of flapping wings. The ParaWulff design combines the two with the parachute hackle tied on each side of the calf’s tail “V.” The result is a decidedly handsome pattern that is as functional and sturdy as it is good looking. I have always liked the idea of using new and creative fly patterns for trout fishing, partially because of my experiences wading heavily fished waters like the Madison and the Henry’s Fork rivers out West, the Pere Marquette and the Ausable in the Midwest and of course the branches of the Delaware out East. Wherever there is a well-fished creek, stream, lake or river you will find educated trout that have all attended their local TU meetings religiously and have graduated from Orvis Fly Fishing School. A trout having the ability to recognize an artificial from a natural fly is a very real occurrence, especially if it sees the same pattern day after day. Standard palmered hackle duns look very similar, especially from the trout’s view, which is normally as an imprint in the meniscus layer or surface film. To set the record straight, we are not talking about hatchery trout with clipped adipose fins and a propensity to hit anything that even begins to look like food, including trout pellet flies. We are talking about native trout, born and raised in the stream in which they live, or in some cases, second- or third-year hatchery trout that have survived on their own long enough to gain back their native instincts. Parachute dry flies mark the beginning of this slow and painful departure from the norm of palmered hackle dry fly patterns that were handed down to us from the golden age of bamboo and gut leaders. The true departure that these flies represent is that they lower the body of the fly into the water so that it rides in the surface film like a natural. Along with parachute dries, we also have comparaduns and thorax patterns that accomplish this same goal of creating a more natural imprint for the trout to observe prior to deciding whether it truly is a meal. Fishing these low riders of the water will improve your percentages and in many cases bring some larger and wiser trout to your net. Try new patterns and new techniques, you never know when you will discover a specific recipe of patterns and tactics that become productive for you on a regular basis.